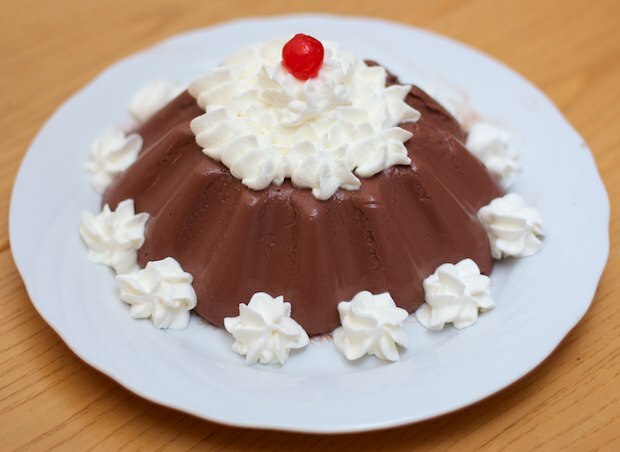 Pudding is a dessert that is usually used by families for children’s snacks. There are many easy-to-use packets on the market that contain all the ingredients you need. Add a little milk and you’re done. Other homemade recipes contain eggs and therefore result in heavier puddings. My husband really likes pudding because he didn’t get a lot of sweets growing up and thought I would use simple ingredients to create a light and quality homemade pudding. It’s important to use pure cocoa powder, not surrogates, purchased in supermarkets or shops that sell fair trade or organic products. In a high-sided pot add all the dry ingredients and mix thoroughly. Slowly add in the cold milk, stirring constantly with a whisk to prevent lumps. Bring the pot to the stove and heat up stirring constantly until it reaches a boil. When it boils, reduce the heat and continue cooking, stirring constantly for 3 minutes. At this time the mixture should thicken. Pour the pudding in 8 individual molds or one large pudding mold. Chill it in the refrigerator for at least two hours. Garnish with whipped cream and cherries.